"The Bad Brothers are good friends, dedicated individuals who came together for the sole purpose of making great high elevation wines." 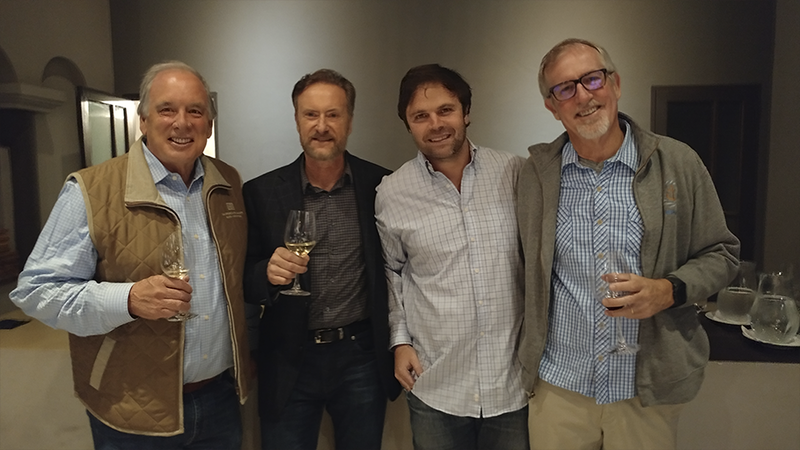 In 2014, long-time friends and fellow winemakers William Knuttel of Napa Valley, California and Agustin Lanus of Argentina, along with international entrepreneur David Galland, decided to form a collaboration to make fine wines from the high altitude terroirs of Cafayate, Argentina. The result was BAD Brothers Wines, the name derived from the first initial in each of the partners names, Bill - Agustin - David. Subsequently, the three friends were joined by a fourth, internationally acclaimed architect, Jack Zehren. 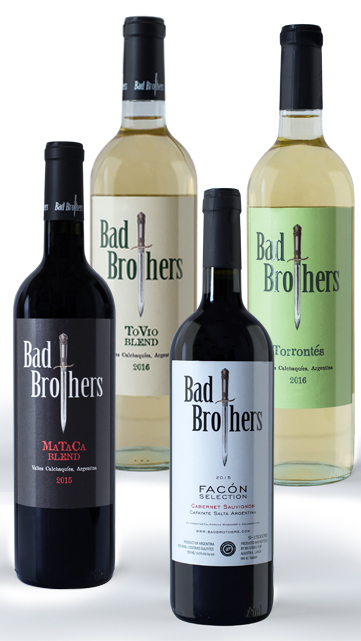 Today the Bad Brothers produce three different wines, two reds and one white, each of which highlights the best attributes of the high altitude varietals of Cafayate, the fast growing hub of winemaking in Argentina's Calchaqui valley. 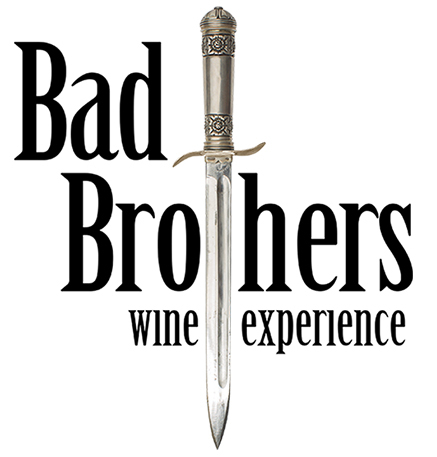 In November of 2016, Bad Brothers Wine Experience opened, a boutique wine bar/restaurant featuring the Bad Brothers wines. In just three months it became one of the top rated restaurant in Cafayate by Trip Advisor and has since been featured prominently in the Wine Enthusiast, Departures magazine and many others. ToVio, a proprietary blend that adds 25% locally grown Viognier to a Cafayate Torrontes to produce a smooth drinking, fresh white wine ideal for a warm summer day. MaTaCa, a blend that brings together the fruitiness and smoothness of Malbec, the volume and structure of Tannat and the elegance of Cabernet. Facon Selection Malbec 2016, a true expression of the combination of the elegant yet rich wines produced from the high altitude vineyards of the Calchaqui Valley, Salta, Argentina. Located at 1,700 meters above sea level the quiet pueblo of Cafayate sits on the floor of a high desert valley surrounded by the towering Andes mountains. Increasingly important in Argentina viticulture, the Calchaqui valley now hosts vineyards from some of Argentina’s best known winemakers. Cafayate is famous for year-round sunshine, with approximately 320 sunny days each year. Combined with the cool nights typical of high desert terroirs, the vineyards benefit from a high degree of thermal amplitude, the range between day and night-time temperature. Production: Vintages quantities vary, please contact us for availability. In November of 2016 Bad Brothers Wine Experience opened to rave reviews. Located just off the main plaza in Cafayate, it features the full range of Bad Brothers Wines along with a sophisticated menu of tapas to enjoy them with. Within just three months Bad Brothers Wine Experience moved through the ranks to become one of TripAdvisors top Restaurants in Cafayate. Among a lot of other media coverage Bad Brothers Wine Experience has been featured in Wine Enthusiast, one of the world’s most prestigious wine periodicals, Departures magazine, the premium magazine for AMEX Platinum card holders and La Nacion, Argentina’s largest newspaper. When next in Cafayate, the Bad Brothers look forward to welcoming you to share in the experience!